I am playing hooky today... Well, not really, but I am getting pudding brains this close to deadline and I need all the extra bit of time I can find. After coming to the conclusion that sleep is highly overrated and lunch has been replaced by a cup of soup and a piece of toast in one hand, whisk and camera in the other, (yes, I am also amazed of my newfound dexterity! ), I asked one of my favorite bloggers to come and keep you company. I discovered Cindy in one of my late night blog hopping and I instantly fell in love with hers inventive crafts, thoughtful posts and awesome pictures of New York. When I ask someone to guest blog I always tell them to do what they please and have fun. 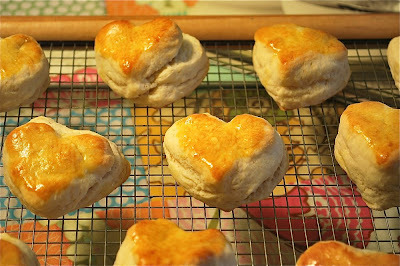 Cindy went beyond the call of duty and baked you something tasty, comforting and perfect for a little Valentine's day breakfast. I guess I am in love mode after all! I hope you'll show Cindy the same enthusiasm and support you show me day after day. Enjoy! Hi Everyone - I'm Cindy from quaint handmade and was so honored when Helen asked me to be a guest blogger here on Tartelette. It wasn't a task to be undertaken lightly as she is an award-winning blogger. As you know, Tartelette is a serious baking destination featuring fantastic recipes all beautifully photographed. I'm not a prolific baker by any stretch of the imagination, but have been known to knock around some pots and pans in the kitchen from time to time. And, since I've been a collector of all things English for years, I thought I would write about a Sweet Tea, which would be lovely for Valentine's Day. Now, this is a special post for a special lady and her devoted readers, so I pulled out all the stops and feature tasty delights you might want to enjoy on a special day. But, it doesn't have to be fancy. Most of the food can be found in the local market, online, or in your cupboard. I also included a simple scone recipe for a homemade touch. First up, it's time to go shopping! 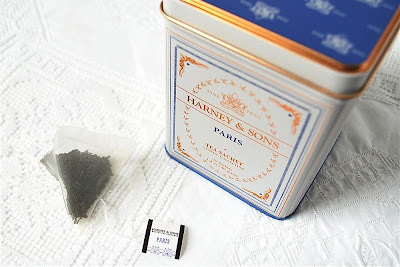 I've been coveting tea from Harney & Sons for a while now and chose their Paris blend. It's a black tea with a lovely fruity fragrance. True tea aficionados might prefer a loose tea, but I thought the sachets were pretty. As the flavors in our sweets are delicate, a subtle Jasmine Tea from Twinings or Kusmi would also be wonderful. My husband likes tea, but loves coffee. We've recently discovered Stumptown Coffee and it has a rich, smooth flavor that would also be a nice alternative. Next up, jam to go with our scones. 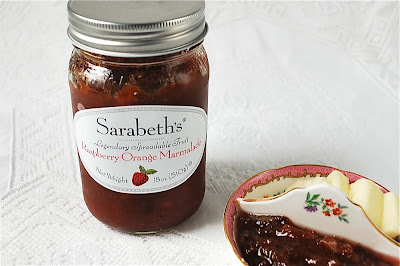 I've loved the preserves from Sarabeth's for years and chose the Raspberry Orange Marmalade I found in our local market. Conserves from Wilkin & Sons are also delicious as are the jams from Bonne Mamon. Be sure to have some delicious butter on hand, too. We are lucky to live in NYC and can purchase delicious treats from Whimsy & Spice in the warm weather at a market in Brooklyn. But, it's winter so I ordered their Herbs & Spices Gift Box online. The assortment is filled with goodness and includes Honey Lavender and Chocolate Orange Cardamom shortbread cookies, Cardamom marshmallows (so fragrant), Coconut White Chocolate 5 Spice cookies, and the most intriguing, Rose & Black Pepper Thumbprints (subtle). All of the flavors are delicate and light. 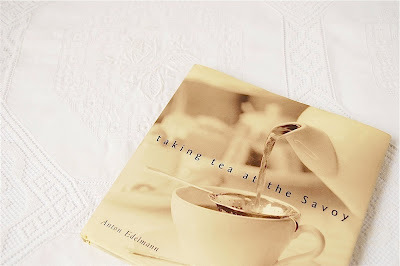 I learned about the book Taking Tea At The Savoy when the author, Anton Edelman, from the Savoy Hotel appeared on Martha Stewart's original television show. He was quite impressed with her ability to make a proper cup of tea and became a little bit flirtatious. It was kind of funny to see Martha under those circumstances. It's a wonderful book with a variety of traditional English tea recipes. I wanted to make something for our tea and scones are traditional. This recipe is simple enough, but doesn't mention salt, so I added a pinch. I also added more flour as the dough was quite sticky. I am a newbie photographer and have learned so much from Helen. However, ever since picking up the camera, I've become a little bit impatient as a cook. 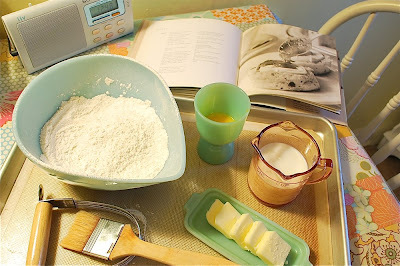 I am absolutely amazed by the ladies who bake and take photos along the way. I do try to assemble the ingredients and tools I need in advance to at least capture the beginning and the end, although I made an extra effort for this post to get the middle, too. 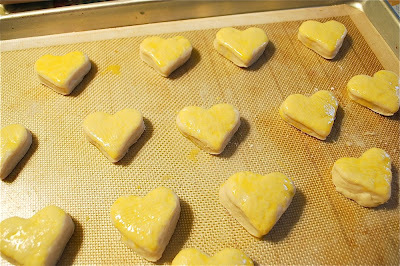 My round pastry cutter seemed to be in hiding and after trying a few alternatives, I used a heart. I hope it was divine intervention from cupid because I'm so happy they were in heart shapes and perfect for a Valentine's Day Sweet Tea. Out of the oven and cooling on a wire rack. I think the egg wash helped identify them as hearts since the dough rose quite a bit thanks to a box of fresh baking powder. You should have seen our kitchen after I made the scones! 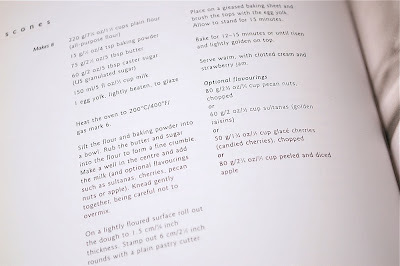 I think there was too much mess for such a simple recipe. The other side of room, which is three feet away, was worse. As I mentioned, the dough was quite sticky so there was flour everywhere, including places it shouldn't be ;). At this point, I'm just about ready to pull it all together. I've selected some pieces from our English china collection and the double tiered cake stand is the star. I've polished the silver and endlessly fussed with the arrangement. My husband Scott went for a walk and to pick-up my one missing item - sugar cubes. I didn't ask him to come right back because I wasn't expecting to be ready that day in terms of choosing the china. By now, I really have to photograph the Sweet Tea, or I'll have to disassemble everything, and start all over again the next day. Plus, those cookies are so fragrant and look delicious. Finally, everything is arranged and it's time for tea + coffee! Thank you for your hospitality everyone. One lump or two? Good luck with the deadline, I am sure you will be fine! That's one cool blog you have Cindy! Love the setting up for the tea! :) I'm too, like you (probably worst)...I can't bake and photograph at the same time, cos' usually I'll be interrupted by my two monkeys (http://my-2-little-monkeys.blogspot.com/) --- don't get me wrong, I love them dearly, just that they tend to interrupt when I am busiest! So for right now, I can only photograph the outcome of whatever I cook/bake. 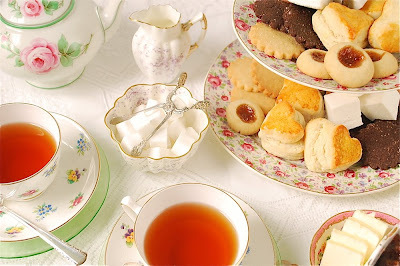 We had tea time once at a gathering with friends. It was so much fun. Great idea. Hi Cindy, right from the start to the end you held my attention. I loved the way you gathered the things, put them together and invited us over to tea. The Chinaware looks very pretty and...a lump for me please:) Thank you!! Helen, thanks for introducing me to another lovely blogger, and wish you lots of luck and loads of energy!! Such a beautiful tea with scones to be invited to. One lump please. Sigh . . . how will I ever make a choice with so many good things. I love your "English" display, so pretty. Being English I think it's such a shame that I don't know any English person who has ever served me tea like this, normally in a Mug with a teabag (no teapot). Such a shame, I'd much rather come for tea with you! so lovely! oh cindy! what a wonderful post! your tea party looks incroyable! so pretty and dainty and...englishy! What a wonderful piece. I love scones! In fact will be making some this weekend. Whimsy & Spice is a new fav of mine! Yum. I make scones almost every weekend, to have with tea. I have a tea cupboard, I have so much tea. Paris is my favorite from Harney & Sons, but my favorite tea is the Granville Island Blend from the Granville Island tea Company (good enough that I pay the international shipping for it!!). I prefer cream scones, the ones just with cold butter and cream, and my husband prefers the texture of scones with eggs in them. So we go back and forth. Such an elegant spread!!! perfect.. I love this! What a thoughtful and sweet post. Perfect for Valentine's Day. I've always wished Americans had tea time, and this shows me how much fun creating my own setup can be. Thanks for sharing, everything looks wonderful! Wow! You have great instinct for wonderful guest posters Tartelette. I love how detailed and thoughtful this post is, much like the English tea time! My favorite teas are from Marriage Freres and I always try to get my old roomie to send me some. cindy....fabulous post and everthing looks so yummy! I would love to sit down to that tea! Or any tea, really, but especially one with such a great spread of goodies. Afternoon tea is such a treat! I love the Sarabeth's strawberry rhubarb jam; I think I would use that one instead. from one traditional afternoon tea-er to another, this is lovely! Love your guest blog today...so very sweet!! 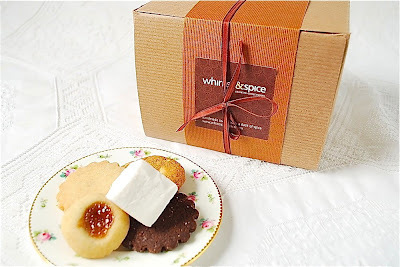 Also, thank you for your mention of Whimsy & Spice I have already contacted them to get their yummy treats in my shop. PS. We love Sarabeth Jams as well. Marvelous! these scones look really cute! WOW Cindy - such a great post filled with amazing photos! très belle vaisselle! j'adore!!! et le famaux bazar de la cuisine me rappelle ...la mienne!!! Cindy! This is incredible! I love the idea of a high tea :) You did such a great job! I LOVE this. I spent most of this past summer sitting in Tea and Sympathy here in New York eating (and drinking) cream tea. And I have to say that I adore Martha in flirtatious mode...it absolutely cracks me up. thank you all for your wonderful comments and stories. i can't even tell you how nervous i was about this post. jenny - i will look up the tea you mentioned, it's new to me. i love how you are your husband have dueling scones. dana - i love the strawberry rhubarb jam, too. let's have both! laura - i've never been to tea and sympathy, but must go. A beautiful post full of lovely detail and lots of gorgeous things! i think this post is, in a word, lovely. there is something about a tea party that makes me smile. yay! great post + great pics! How wonderful! I love tea and scones! I am kind of glad you could not find the round cookie cutter either as these turned out just lovely! Cindy this post ia amazing (vintage style)!!! Love it be pround of your work!! I feel as if I really am invited to tea! Your post is lovely, Cindy; it defines sweetness in so many ways. Thanks for the joy of your visit. I LOVE your beautiful dishes, too! Tea is my favorite beverage of choice. I need to get that book, Taking Tea at the Savoy. I have a fascination for all things revolving tea time. 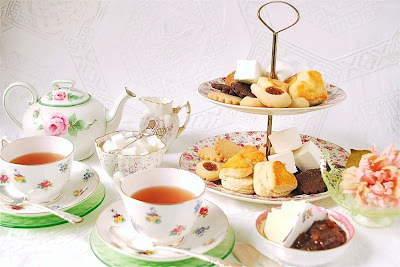 I love the table set up, the finger foods, the beautiful cups... sometimes I dream of being British. sigh... what a wonderful post cindy! It's the little things in life...like this...that make you feel good. What a treat to open up Helen's blog today and see this beautiful array of tea goodies! Well done and gald to meet you Cindy! Very sweet display...well done! 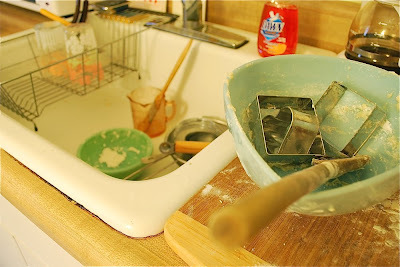 Thanks for sharing the pics of the mess, too, so I know I am not alone when I see my kitchen look like that! I am ready for my cup of tea, now! Oh Cindy, you went all out for us. Thank you and what a delightful spread! Wow, the perfect tea party. Once again beautiful photos! What a devine tea party! The china and silverware is just beautiful. What a lovely blog you've got -- all the special things I love to enjoy. Tea and scones are a favorite and you've really displayed your lovely work well. Just perfect! 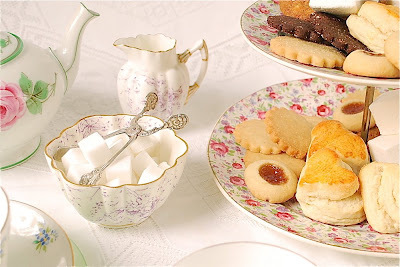 Your tea service and goodies are simply stunning, just perfect for high tea. 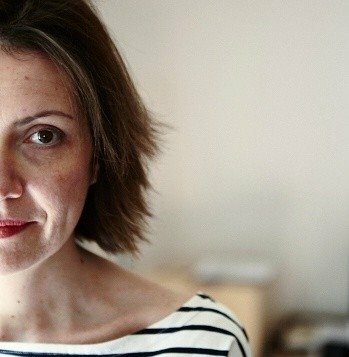 She has a beautiful blog. Thanks. Beautifully done Cindy! I can imagine the work that went into creating this post. I don't know how foodies do it. Never mind that for me, cooking is a huge challenge in itself, but to then photograph it along the way and have everything come out looking so scrumptious!??! I'm so impressed that you were able to pull it off so perfectly. Quand je vais à New York , je vais toujours prendre un brunch chez Sarabeth's ! la prochaine fois je ramènerais des confitures.